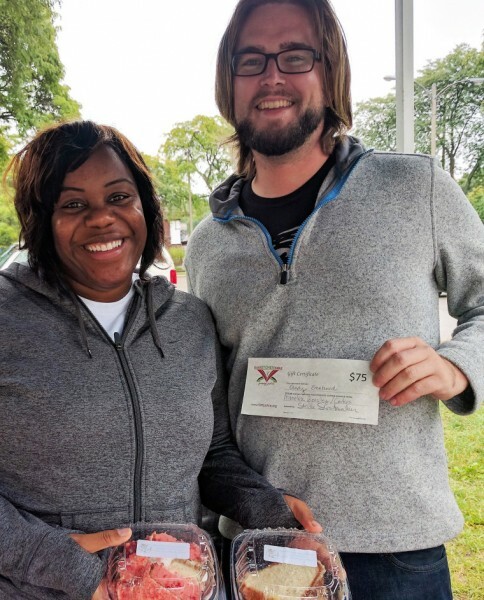 The Southeast Area Farmers' Market hosts its annual Greens Cook-off and Green Tomato Festival, 11:30 a.m. to 2 p.m. Saturday Nov. 3 at LINC parking lot, Madison Ave., just north of Hall St. SE. LINC parking lot on Madison Ave., just north of Hall St. SE. 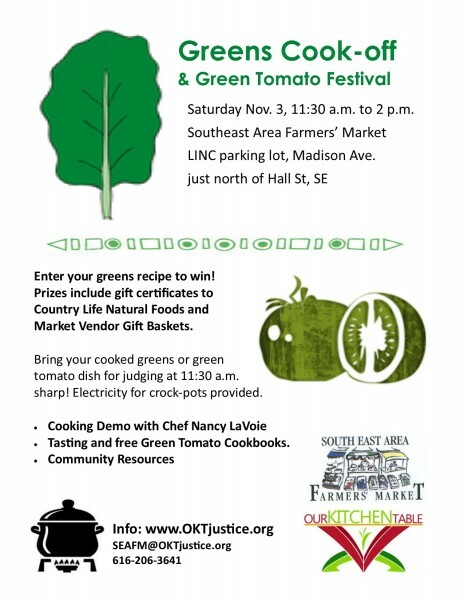 Enter your greens or green tomato recipe! The Southeast Area Farmers' Market is gearing up for its annual Greens Cook-off and Green Tomato Festival, 11:30 a.m. to 2 p.m. on Saturday, Nov. 3 at the LINC parking lot on Madison Ave., just north of Hall St. SE. Everyone is invited to enter the cook-off. Simply bring a crock pot of greens or green tomato dish to the market by 11:30 a.m. Electric plug-ins will keep crockpots warm. Judging will begin at noon. Dishes will be judged on flavor, nutritional value and “wow” factor. Prizes, including a gift certificate for Country Life Natural Foods and market vendor gift baskets, will be awarded no later than 2 p.m.
Celebrity chef, Nancy LaVoie, will offer cooking demos and tasting. Nancy serves as Director of Culinary Events at Thought Design Management Consultants. She has taken part in past Southeast Area Farmers’ Market cook-offs and contributed many delicious recipes to the market’s Green Tomato Cookbook — even a cake.